Whang’s Black Belt Taekwondo Academy was established in 1984 at Lindfield. 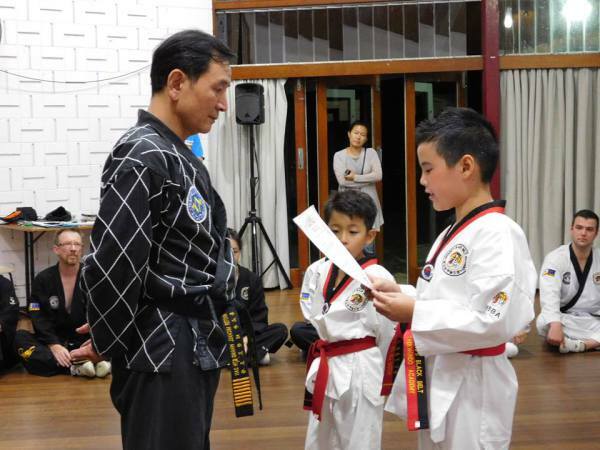 Since 1984 Master Whang has taught Taekwondo to hundreds of students from Lindfield, Killara, Gordon, Roseville, Chatswood, Chatswood, Castle Cove, Artarmon, Willoughby, Artarmon, Pymble, St Ives, Forestville, Killarney Heights and French's Forest. Academy runs classes at Lindfield and St Ives. Our training environment is friendly, safe, defence orientated and highly technical. All classes are personally taught by Grandmaster Whang. Learn from an internationally recognised and respected grandmaster. Grandmaster Whang believes in teaching traditional values with modern techniques. Try our system of martial art that has been developed over 30 years by Grandmaster Whang. Trial lessons are obligation free and free of charge. Grandmaster Whang teaches World Taekwondo Federation style including Kukkiwon standardised poomse. Whang's Black Belt Taekwondo Academy/Grandmaster Whang is registered with Kukkiwon, World Taekwondo Changmookwan Federation, World Hapkido Martial Arts Federation, International Martial Arts Federation, Korea Martial Arts Society and Korea Composite Martial Arts Federation.